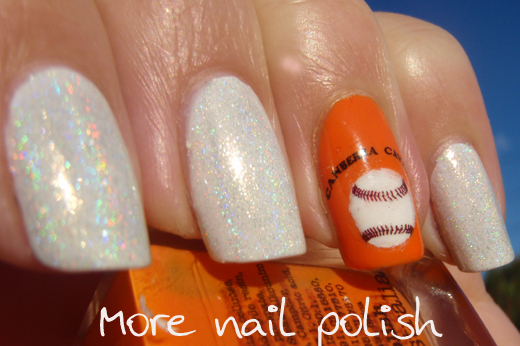 I said I was going to do Canberra Cavalry baseball nails for every home game, so here are the nails I wore for this weekends home series. The team finally got white uniforms for home games this season, so because they were wearing their whites, I decided to as well (with an accent nail). I don't do accent nails very often, but I really love them. I think I will do them more! I also layered a Spectraflair top coat over the white. It looks amazing. Holo topcoat over white certainly curbs my lemming for Glitter Gal Light as a Feather. The orange polish is Picture Polish Citrus. It's the perfect bright orange creme. A lovely summer colour. Here is a close up of my accent nail. This is a water decal that I had made up from a site on eBay. 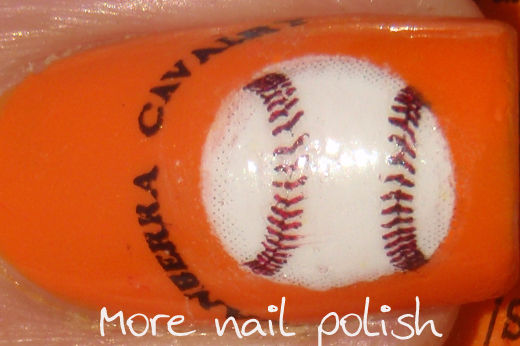 The only tricky bit is that the decals are on transparent paper, so I have to create a white dot on my nail. I did this by punching a hole in a piece of paper and then sticking that to our glass table. I then used that paper as a konad template and put my polish in the hole, wiped it off, picked up the polish circle and stamped it on. It worked amazingly well. And the hole punch I had was the perfect size for the shaded baseball on the decal. Here is a close up of the holo topcoat on the white. Sooooooo purdy!!! And now a quick story about the local wildlife. Yesterday Mr Three was playing out in the backyard and came sprinting inside. He told me he saw a really big dinosaur outside. I grabbed my camera and followed him out. I asked him where it was and he walked me up to under the apple tree. "Don't get too close mummy, you don't want it to bite you". Of course there was nothing to be seen anywhere, but we have now figured out that he saw some sort of lizard! We've had blue tongue lizards in the backyard before, but I'm not sure what this one was. While out there I heard another strange sound which I investigated. 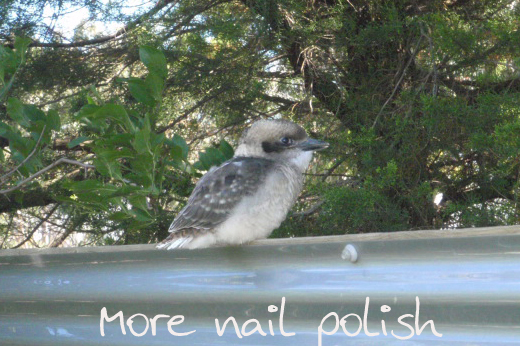 Sitting on the side fence was this very cute and fluffy baby kookaburra. The kookaburra's have been laughing their heads off here recently with all the stormy and wet weather. It's mother and father were flying around in the gum trees too. I snapped a picture of one of them with a MASSIVE spider in it's mouth, but forgot that the camera setting was only on VGA and not 10MP. D'oh! But then again, I'm sure not too many of you would want to see that spider in the birds mouth. We grow them big down here! The other week when I was playing golf, there was a huge troop of kangaroos (and apparently 'troop' is the correct terminology for a group of them!) I really wished I had taken my camera to show my international readers just how close the roos roam near us down here! I want to share more pics of the local wildlife, I hope you all don't mind. The spectraflair TC over white looks better than Light As a Feather! 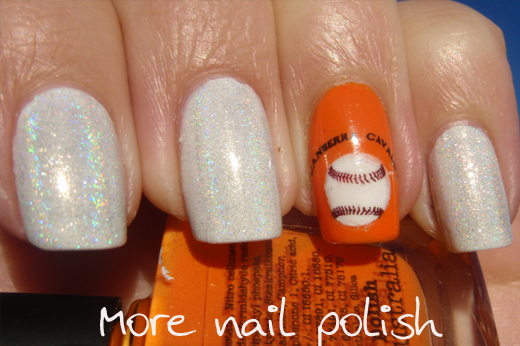 I love the mani!! That is really nice water decal and I love how u put a dot under it. Super idea!! Kristy - It looked like a good old huntsman! It's body was a big as my two thumb nails together - easy! Poor fella ended up Kookaburra lunch! I've got the kookaburra song playing in my head over and over and over again hahaha! Great pics (mani and animals).